Family network and genealogy site MyHeritage revamped its family tree charts feature with new designs site members can customize online and print for free. The site also launched a professional poster-printing service for any chart produced on the website, as well as a chart design service. If you have your family tree information on MyHeritage, you can click on the Family Tree tab on your family site, then select Charts and Books. 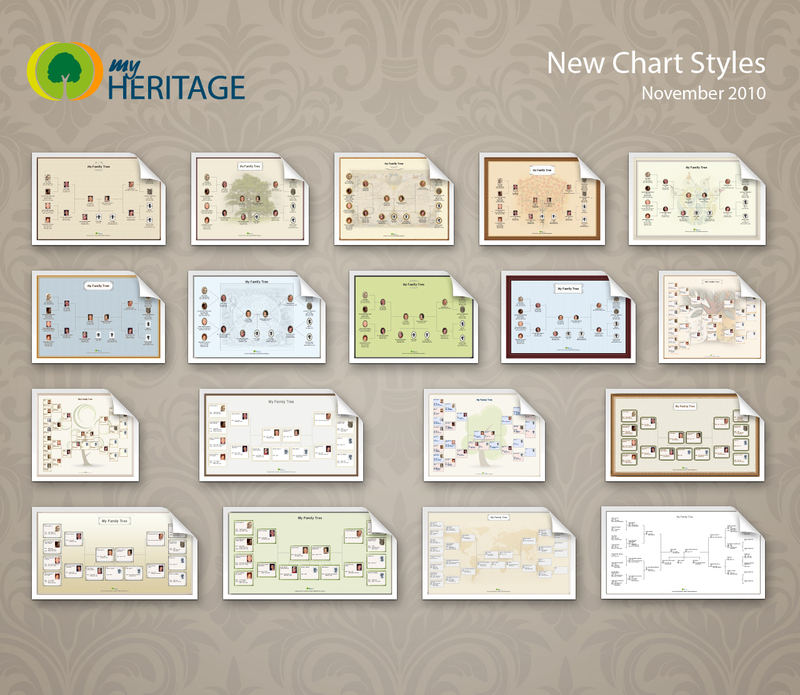 Choose from 18 chart types, including new bowtie and hourglass designs. The MyHeritage version of the hourglass format is unique in that it can include the ancestors of any spouse. You also can customize your chart with border designs, frames, backgrounds, decorations, colors and fonts. You can opt to include information such as names, birth dates, wedding anniversaries, photos and personal notes. This is an example of a bowtie chart, with a nuclear family in the center and each parent’s ancestors on the sides. This all-in-one chart shows collateral relatives—aunts, uncles, cousins and siblings. You can export your chart for free in high-resolution PDF format to print or share via e-mail. You also can order a professionally printed poster starting at $20. A variety of paper types (standard, matte photo, glossy photo, vinyl or canvas) and sizes (including huge wall charts for family reunions) are available, with optional lamination. MyHeritage provides free hosting for family websites up to 250MB and trees up to 250 people, with more storage and features for $6.25 to $9.95 per month. You can start a MyHeritage tree by uploading a GEDCOM or typing in names. Learn how to make the most of your MyHeritage membership with Family Tree Magazine’s MyHeritage Web Guide download, available from Family Tree Shop.